You are currently browsing the tag archive for the ‘clutter’ tag. T O O M U C H S T U F F ! The average ten-year-old child has toys worth almost £7,000 but plays with just £330 worth of them, a study has shown. A typical child owns 238 toys in total but parents think they play with just 12 ‘favourites’ on a daily basis making up just five per cent of their toys. The study of 3,000 parents also revealed one in two parents admit ‘wasting hundreds of pounds’ on toys their children never play with. It also emerged more than half believe their children end up picking the same toys day in and day out because they have too many to choose from. Do we buy too much ‘stuff’ for our kids? We do. But note – we also buy too much stuff for ourselves. How else can you explain the amazing popularity of Marie Kondo, her book, and Netflix series? 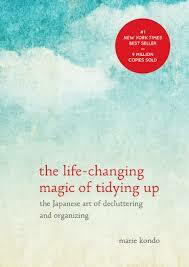 Kudos to Kondo, for helping us reduce clutter and clean up. Now, for a much tougher question — instead of buying stuff and throwing it out, how can we rewire our brains, defeat the consumer spend-and-borrow ethos and stop buying things that bring neither joy nor satisfaction? Kondo’s principle: Does it bring joy? If not, throw it out. Now, let’s take it one step further. BEFORE you buy it — will it REALLY make me happy, after the first 10 minutes? No? Forget it. Is there a Marie Kondo out there, who can write the book on The Life Changing Magic of Not Consuming?